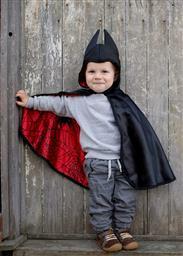 Perfect for little superheroes everywhere this adorable reversible cape offers twice the fun with quality design and versatility. The black satin side feature a yellow bat emblem and reverses to a red spider web satin print on reverse side with large black velour foam spider details. The hood features large bat ears on the bat side and also reverses to the red spider web satin print. The Velcro closure at the neck makes switching superheroes a breeze.